Losing My Mind a Little Bit Trailer: Killing Eve: Season 2! Killing Eve – Jodie Comer (Villanelle) clearly having fun on the set of Killing Eve: Season 2 – Photo by Parisa Taghizadeh/Courtesy of BBC America. Killing Eve returns Sunday, April 7th (8/7C). Love Is Strange Trailer: Killing Eve: Season 2! Killing Eve – Villanelle (Jodie Comer as Villanelle) – Photo by Aimee Spinks/Courtesy of BBC America. ‘Sometimes, when you love someone, you do crazy things,’ says a pajama-clad Villanelle in the trailer for season two of Killing Eve – while a sultry cover of Addicted to Love plays over the rest of the trailer. The premiere of Killing Eve: Season 2 will be simulcast on AMC and BBC America on April 7th. Nominees Announced for 2019 Golden Globes®! The nominees for the 76th Annual Golden Globes® were announced this morning. a complete list of the nominees follows. The 76th Annual Golden Globe® – hosted by Andy Samberg and Sandra Oh – will air on NBC January 6th (5/4C). SANDRA OH AND ANDY SAMBERG NAMED CO-HOSTS OF 76th ANNUAL GOLDEN GLOBE® AWARDS! Sandra Oh and Andy Samberg will co-host the 76th Annual Golden Globe Awards on Sunday, January 6th. Emmy®-Nominated Killing Eve Comes To Home Video! One of the best shows on TV, Killing Eve, is coming to home video from BBC Studios. Killing Eve centers on two women: Eve (Oh) is a bored, whip-smart MI5 security officer whose desk-bound job doesn’t fulfil her fantasies of being a spy. Villanelle (Jodie Comer, Doctor Foster) is a mercurial, talented killer who clings to the luxuries her violent job affords her. Killing Eve will arrive on Blu-ray and DVD on October 9th. Never Tell a Psychopath Trailer: BBC America’s Killing Eve! A deskbound MI-5 agent and a psychopathic killer: one limited by her job description and pay grade; the other not bound by those limits – or any others. Killing Eve premieres on BBC America on April 8th (8/7C). BBC America’s Thriller Killing Eve Begins Production! BBC America’s new thriller, Killing Eve, has added Fiona Shaw, David Haig, Kim Bodnia, Darren Boyd, Sean Delaney, Kirby Howell-Baptiste and Owen McDonnell to the cast and begun production in Europe. Based on the ‘Villanelle’ novellas by Luke Jennings, Killing Eve follows two fiercely intelligent women – a psychopathic assassin and the woman charged with hunting her down. Killing Eve stars Jodie Comer (the assassin) and Sandra Oh (the hunter) – and will premiere on BBC America in 2018. BBC America Announces Second Lead in Dark Thriller Killing Eve! Killing Eve – Jodie Comer – Photo courtesy of BBC America. Jodie Comer (Thirteen, The White Queen) has been cast in Killing Eve – the new thriller from Fleabag creator, Phoebe Waller-Bridge – opposite Sandra Oh. Commer will talented killer Villanelle who comes into conflict with deskbound spy wannabe Eve (Oh, Grey’s Anatomy, Catfight). Killing Eve will debut in 2018. Encore’s Thorne Is Slick and Dark, Shiny and Gritty! Encore has scheduled television adaptations of two of Mark Billingham’s Thorne mysteries – Thorne: Sleepyhead and Thorne: Scaredy Cat – for the next two nights (Tuesday & Wednesday, 9/8C). 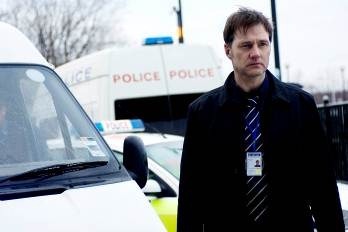 Both deal with serial killers in ways that mix elements of some of the classic British cop shows of the past with bits and pieces influenced by American procedurals. It’s an odd, but mostly successful mix. Grey’s Anatomy: Two Hours of Prime Primetime Medical Drama! After a couple of seasons of less than enthralling soap, Grey’s Anatomy [ABC, Thursdays, 9/8C] regained its footing last year and, in this season’s two-hour premiere, it continues to move forward with style, substance and fun.